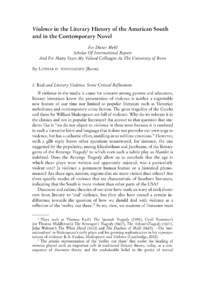 If violence in the media is cause for concern among parents and educators, literary historians know the presentation of violence is neither a regrettable new feature of our time nor limited to popular literature such as Victorian melodrama and contemporary crime fiction. The great tragedies of the Greeks and those by William Shakespeare are full of violence. Why do we tolerate it in the classics and not in popular literature? An answer to that question that students like is we do not object to violence in these texts because it is rendered in such a narrative form and language that it does not provoke our own urge to violence, but has a cathartic effect, instilling in us sublime emotions. However, such a glib reply leaves other questions unanswered, for instance, the one suggested by the popularity, among Elizabethans and Jacobeans, of the literary genre of the Revenge Tragedy to which even such a subtle play as Hamlet is indebted. Does the Revenge Tragedy allow us to conclude that the age in which these plays were written and apparently enjoyed, was a particularly violent one? Is violence a permanent human feature or a historical phenomenon? Are there ages, nations, regions that are more violent than others? Are there specific modes of violence that are characteristic of Southern literature, indicating that the South is more violent than other parts of the USA?